He has composed soundtracks for tv & radio around the world. 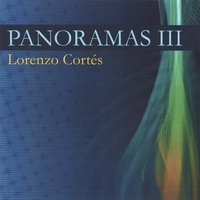 Lorenzo Cortes’ “Panoramas 3” is a dramatic, explosive collection of ambient/electronic sounds that leaves the listener on the edge of their seat. Flawlessly crafted compositions grace this record from start to finish. With beautiful stringed arrangements that yield symphonic beauty and provoke dramatic feelings, this CD puts the listener through a theatrical audio experience. “After Holocaust” and “Armagedon” shows the amazing artistic precision of “Panoramas 3.” That is, every song conjures the intended feeling and imagery suggested by the song title. This single element puts this album among one of the most dynamic sound tracks available. Moreover, the production of “Panoramas 3” carries the same amount of professionalism and precision expressed in every other area of the CD. This assembly is truly one that is unforgettable, and whose rightful place is the surround-sound of the big-screen!